↑ J.S. Grewal, The Sikhs of the Punjab, in The New Cambridge History of India. 2, 3. Gen eds. Chris Bayly, Gordon Johnson, John F. Richards. Cambridge: Cambridge University Press, 1998, pp. 63-64. ↑ Richards, John F. The Mughal Empire, in The New Cambridge History of India. 1, 5. Gen eds. Chris Bayly, Gordon Johnson, John F. Richards. Cambridge: Cambridge University Press, 1993, p. 97. ↑ Vir Singh, ed. Varam Bahi Gurdas Satki, 9th edition. New Delhi: Bhai Vir Singh Sahitya Sadan, 1997), p. 386. ↑ Father Jerome to Father Gasper Fernandes, (BM add MS 9854, ff. 38-52), 1617, in Sicques, Tigers or Thieves: Eyewitness Accounts of the Sikhs (1606-1809). Eds. Amandeep Singh Madra and Parmjit Singh. Palgrave Macmillan, 2004, p. 7. 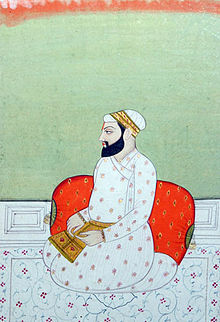 ↑ Mobad', Dabistan-i Mazahib, 1645-46, in Sikh history from Persian sources. Eds. J.S. Grewal and Irfan Habib. Indian History Congress: Tulika, 2001. p. 67. DiscoverSikhism - Sri Guru Arjan Dev Ji Sri Guru Arjan Dev Ji is the fifth of the Ten Sikh Gurus. Read about his life and stories here.